Text: Differential Calculus On Normed Spaces by Cartan 2nd Ed! TEXT DIFFERENTIAL CALCULUS ON NORMED SPACES: FINALLY AVAILABLE AGAIN AFTER NEARLY 50 YEARS! ACCORDINGLY,THIS BOOK HAS BEEN RETITLED WITH NEW ADDITIONS FOR A MODERN AUDIENCE! BEST OF ALL, A BRAND NEW PREFACE & COMPREHENSIVE SUPPLEMENTARY BIBILIOGRAPHY HAS BEEN WRITTEN BY KARO MAESTRO AKA THE MATHEMAGICIAN! Cartan's unique text has been reissued after nearly a half a century. It's the 1st half of the English translation of Cartan’s famous Cours de calcul différentiel, given by the author at the University of Paris at the height of the Bourbaki movement in mathematics education. Bourbaki-the remarkable school of abstraction which the author helped co-found and popularize in Europe! The 1st text's republication in a cheap edition finally makes readily available again the English translation of both long separated halves of Cartan’s famous 1965-6 analysis course at The University of Paris. 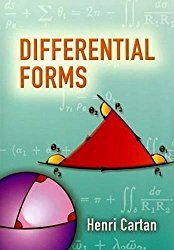 The 2nd half has been in print for over a decade as Differential Forms, published by Dover Books. Without the 1st half, it has been very difficult for readers of that 2nd half to have the proper prerequisites. Consequently,this publication finally makes the entire course available again as Cartan originally intended! At the time of its publication, this presentation represented the height of rigor and abstract in a calculus course for talented students. It’s like no other text on calculus/analysis at any level you’ll find anywhere. & its sequel that they present careful calculus on Banach spaces. Cartan's approach over normed instead of metric spaces has the main advantage of a unified theory of functions of one and several variables. For example, there is a single definition of a derivative as a linear transformation between subspaces of a Banach space. The needed vector space structure is already present. It doesn’t have to be added ad hoc as in the case of metric spaces. Special cases, such as partial derivatives and Taylor’s theorem, are derived as needed. As the title indicates, this text focuses solely on the foundations of differential calculus on Banach spaces. The integral calculus is developed in the sequel. 4) A knowledge of the computational aspects of multivariable calculus will also be needed for some parts of the book. The basic definitions of topology (metric and topological spaces, open and closed sets, etc.) will be needed as well. A new, detailed preface has been added by the publisher to provide historical context and educational perspective on the text’s approach and structure as well as the author’s intentions. Further, a detailed bibliography has been added comparing and contrasting Cartan’s book(s) to the current standard analysis texts at this level. He also offers detailed suggestions for how it/they can be used by modern students as either main text(s) or as inexpensive supplements for a standard text like Rudin. With both texts now available at very affordable prices, the entire course can now be easily obtained and studied as it was originally intended for a new generation of mathematics students and teachers of analysis! 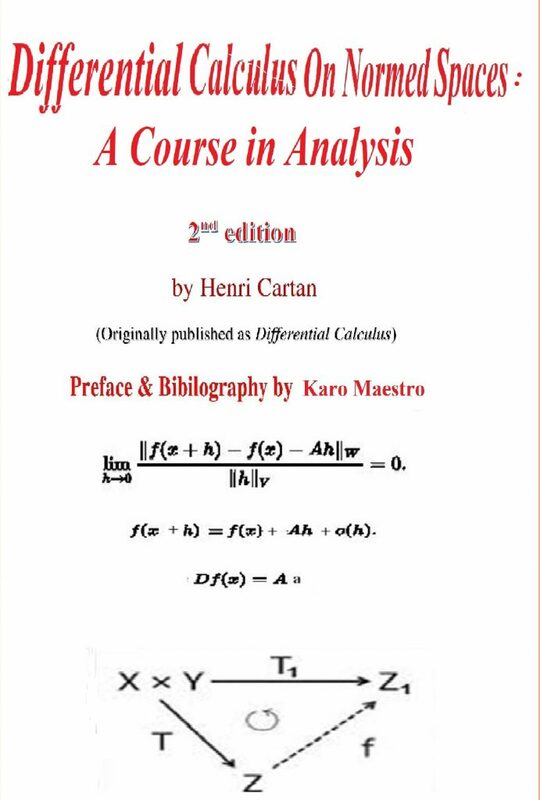 This classic and its sequel can now be used and studied easily and should become standard analysis texts now for university students and teachers! The main purpose of me printing this new edition of DC is so that both volumes of Cartan’s famous course can now be available readily and cheaply to English-speaking students and teachers of mathematics! As I said, the 2nd half been available from Dover Books as Differential Forms. The 2nd half is just as clear, beautifully written and informative as the first. The text’s focus is on differential forms as tools in calculus on Banach spaces. The main use of forms is in path integrals in finite dimensional Banach spaces. As the Frechet derivative generalizes and unifies all the special cases of differentiation in Euclidean paces, abstract path integrals over differential forms unify all the integrals of calculus via Stokes’ Theorem. These methods are then applied to problems in classical differential geometry and the calculus of variations. Since both books are available so cheaply now, there’s no reason not to have both! Click here to buy pbk directly from Createspace. Click here to buy the Kindle E-Book. Click here to buy either at Amazon. Done looking and decided to buy it?Even better,buy it with the sequel (I hope)?Now that you have-do you realize you're lost?Just clicked in from elsewhere to this ad and curious about what website you've landed at? If you're already a regular here, click here to return to the Table Of Contents. I trust you can safely take it from there!